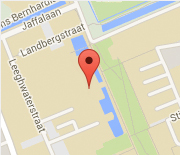 For a route description to the Faculty of 3mE of Delft University of Technology, please see Google Maps. If you come by car, the most convenient parking areas are located on the backside of the building, near Leeghwaterstraat 22. You can enter the Faculty of 3mE through the back entrance. Instructions towards the office spaces of prof. Abbink and the Delft Haptics Lab: From the main entrance of 3mE (Mekelweg 2) – standing with your back to the revolving doors, and facing the 3mE Service Desk – turn to the left, past the coffee corner, and take the stairs at the right that will take you to the 1st floor. You will now face the BioMechanical Engineering Department. Turn right, walk through the doors and continue down the red hallway. Take the first right to enter block F, where there are stairs going up and down. Going a few steps up will take you to the second floor (F2), where you will find David’s office at F2-120. One door after that, you will find the office space of the PhDs, postdocs and students of the Haptics Lab.